This is a series from our writers Holly Narey and Michelle Gonzalez Amador who are taking Jeffrey Sachs’ online course The Age of Sustainable Development. They will be sending out an update on the course every week. Click here for more on all our writers. Check this tag to see all posts on this topic. Last week, through the medium of the internet, we again joined Professor Sachs in the large, airy room from which he gives his lectures for the second instalment of the course. Whilst the previous session gave a detailed yet accessible introduction to the key challenges faced in sustainable development, along with some basic technical concepts, this week things were taken a step further. The focus in this second session was economic development and income inequalities, and the influence this has on wellbeing across the globe. There has also been an impressive growth in social interaction between participants in the course, with some discussion forums reaching upwards of a thousand posts. Contributors can be seen introducing and debating key development topics all over the world. There are over fifty different threads with participants looking for local study groups, with locations ranging from Toronto, to Nairobi, Valencia, and Manchester. The global reach of the course can be seen, and hopefully over the coming weeks more people will join the Google hangouts and forums, and will continue to be educated in what is truly a modern way to learn. Sachs appears to have a knack for discussing the greatest issues the planet faces in a calm, cool way, making them sound like any other problem that requires a solution. The story he tells about the state of inequality across the globe is interspersed with case studies, statistics and potentially intimidating terms and concepts, but he outlines them clearly, making them easy to grasp. The fallibility of various methods of income and wellbeing measurement were highlighted in this session. While GDP per capita can give an insight into the overall productivity of a country, it does not necessarily reflect the standard of living of the population. Especially important to note is that it does not take into account important factors such as healthcare and social inclusion, however it is a good starting point from which to build. We were introduced to the classification of countries that examining GDP per capita allows us to make: low, middle and high income countries, with around one billion people living in low income countries across the globe. Of these, 48 countries stand apart due to social instability, low education levels and susceptibility to droughts, disease and violence. These are the Least Developed Countries, several being in Asia and tropical Africa, and with landlocked countries and small island nations also cropping up more frequently than their total number would suggest. We were introduced to the complex process of attempting to compare different incomes across the globe, and to normalise them taking into account the variation in purchasing power that this money would have within these different countries. Professor Sachs then discussed the issue of urban and rural inequality, along with the current worldwide trend towards urbanisation, with around 70% of the global population expected to live in urban areas by 2030. This brought to light the growing importance of both urban sustainability and agricultural efficiency. Income inequality within countries was then discussed, using the Gini coefficient as a tool to measure income distribution within a country. 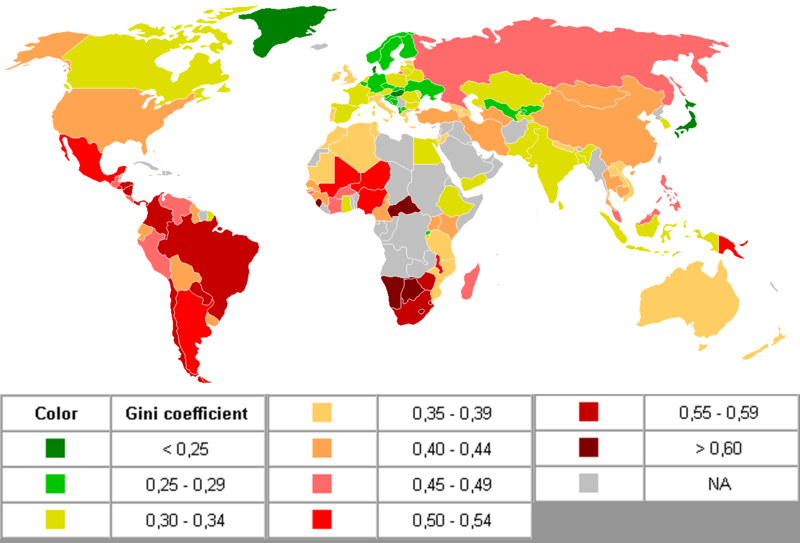 Examples of countries with comparatively healthy (low) Gini coefficients are Sweden, Norway and Denmark, whereas some with with higher Gini coefficients and therefore more inequality within the country are seen in much of the Americas, and in some African countries. These variations in income equality were explained using historical case studies, such as in the case of the Americas, where European settlers displaced local people to establish large landholdings, which have been passed down the generations and led to a more affluent class. Sachs then went on to explain how the solutions to problems of inequality are often contentious, with the individual interests of those with the greater share of the country’s wealth, and often therefore a greater share of the power, using trade and globalisation to increase their wealth while the poor get poorer. Wellbeing was another key topic, especially the individual perception of one’s own wellbeing, with factors such as social inclusion, honest governments, and values of compassion and generosity being credited for increased feelings of wellbeing alongside income. The Human Development Index was introduced as a more holistic measure, attempting to assess quality of life independent of GDP per capita. The week’s session was concluded with the importance of the understanding of convergence and divergence between different economies, with convergence being a key aim in global development. This was an area where, while it is important to take into account the “doom and gloom” of the global situation, it is clear that there are real potentials for improvement, and where improvements have been seen, such as in Scandinavia. Apart from the lectures, the resources on offer are extensive, and give an opportunity to go further than what is discussed. The chapters of the coursebook provided for download in weekly instalments gives thorough background information, and provide figures used in the lectures and more.